Prince Alwaleed bin Talal has signed his first big investment deal since being released from detention in Saudi Arabia. Alwaleed announced a 1 billion Saudi riyal ($267 million) investment in French streaming music service Deezer on Thursday. The investment was made through Alwaleed's Kingdom Holding Company and his entertainment business, Rotana. The prince said in a statement that the deal "represents one of the many premium investments that we have always sought for our shareholders." Kingdom Holding owns shares in Twitter (TWTR), Citigroup (C) and JD.com (JD), and has also invested in Lyft and Careem. Deezer, which competes with Spotify (SPOT) and Apple Music, said in a statement that the round of funding from Alwaleed and other investors valued it at €1 billion ($1.2 billion). Saudi authorities held Alwaleed for nearly three months as part of a crackdown on alleged corruption. The prince was arrested in November alongside dozens of other royals, government officials and prominent businessmen and held at the Ritz-Carlton hotel in Riyadh, which became a makeshift, luxury jail. 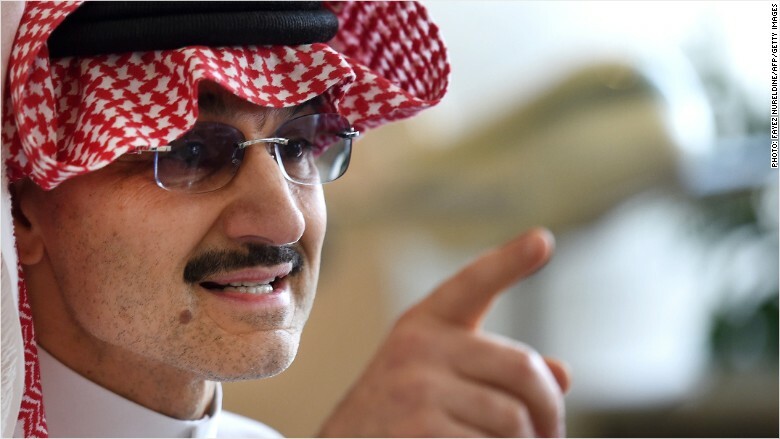 Just hours before his release in January, Alwaleed told Reuters that there were "no charges" against him. Other detainees held in the anti-corruption swoop were freed only after reaching settlements with the Saudi authorities that required them to hand over cash and assets worth billions. The conditions of Alwaleed's release were not made public and it's unclear if his personal fortune remains intact. Forbes, which estimated his net wealth at $18.7 billion in 2017, removed him and nine other Saudis from its list of billionaires earlier this year. Alwaleed told Bloomberg in March that Forbes was wrong to remove Saudis from its billionaire list. Bloomberg estimates his wealth at nearly $17 billion. Kingdom Holding did not respond to requests for comment outside normal business hours on Friday. Billionaire Prince Alwaleed bin Talal runs the investment firm Kingdom Holding in Saudi Arabia. The new deal gives Deezer the exclusive rights to distribute content from Rotana in the Middle East and North Africa. Rotana has a large catalog of Arabic music, TV and films. "The distribution agreement covers markets in which the entertainment sector is growing, including Egypt, Saudi Arabia, Turkey and the United Arab Emirates," Deezer said in a statement. Deezer, which launched in Paris in 2007, has 14 million active users and a playlist of 53 million tracks. Alwaleed got his start in business in 1979, making investments in Saudi real estate and construction. But he quickly turned to banking. He captured Wall Street's attention by becoming one of Citi's major shareholders in 1991. Later, when the global financial crisis caused the bank's shares to plummet, he increased his stake in a show of confidence. Shares in Kingdom Holding peaked on the Saudi stock exchange in 2014, but have fallen about 70% since then.